I'm still in a wait-and-see-if-your-data-is-fully-recoverable place until Monday. There's nothing I can do about it right now, and my options are somewhat limited if it turns out that the Nice Computer People can't recover all of my stuff. Thus, agonizing over spilled milk (or a disintegrated hard drive) is pointless, n'est-ce pas? - The public library system has made a whole bunch of ebooks available to borrow on the Kindle. I can't tell you how excited this made me. I am reading NOTHING but utter drivel on my Kindle. (I'm finishing the "in Death" series by J.D. Robb, in case you're curious.) No War and Peace for me! - Egg season has begun! I have gone through 30 eggs in 2 weeks. Chances are good those numbers will rise as the temperature drops. This last week alone, I baked three batches of cookies and a loaf of pumpkin bread, along with the usual egg-using suspects. - I finally got the dogs licensed. Every time I say (or think) that, I think "Licensed to kill." That's probably not what the City of San Jose has licensed them for. I'm also not letting Elphie convince me to give her the keys to my car. Especially not after she stole half of my salami sandwich yesterday. 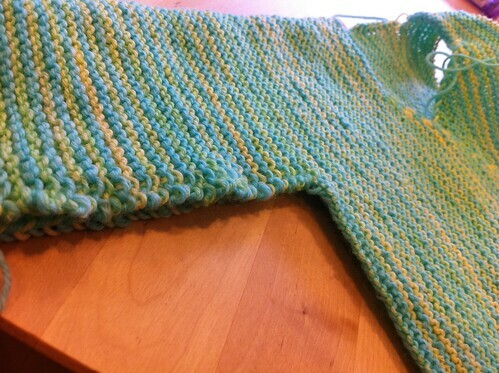 - I need to complete the finishing on Logan's sweater. 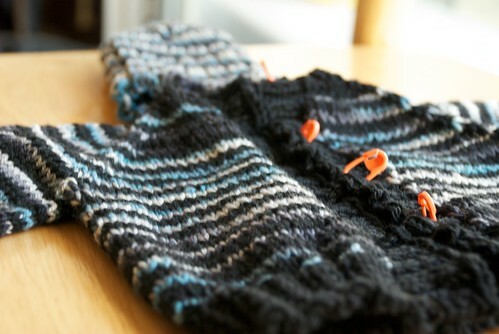 It shouldn't take me longer to sew on the grosgrain ribbon and buttons than it took me knit the whole sweater. Longest journeys, one step, yadda yadda. Just in time for Sharks season! - I didn't spin enough for Andrew's sweater. I really liked spinning it the first time, but when you're spinning (roughly) another POUND to get enough yardage, it takes the wind out of your sails as a spinner. Especially when you thought you were done with the spinning and ready to start the knitting. And you only have 84 days left in 2011. And a huge husband. Of the 15 ounces extra I needed to spin, I have about 8 oz left to spin. Not bad, really. - I'm knitting a tiny sweater for SharkBean. I'm on the finishing part of that one, too, and that's where I'm stalling out. Notice a trend? You should see this with the ruffle. So cute! - I've reached the "wear a headband" stage of growing my hair out. And I'm 24 weeks pregnant. Guess whose license needs renewing WITH A NEW PHOTO? According to my math, it should have required renewing LAST YEAR, you know, when I had a great hairdo in an awesome color, and I was in the best shape of my life? The universe will make it so I never have a great driver's license photo. It's a petty complaint, but seriously. I managed to pull of a reasonably decent photo for my ID card by driving to the photographer's immediately after having a major restyling job at my favourite hairdresser's. It took some careful planning, but at least I look like my picture for once. I am currently reading Ina May's Guide to Childbirth too and I LOVE it. I am now 20 weeks along. This week we begin a 12 week natural childbirth class and I am super excited. I love Ina May's Guide to Child Birth. I was hoping for a VBAC with my second child and I read Ina's book in preparation. Unfortunately, I did end up with a second c-section but I've read her book two more times since then (my daughter is 16 months) and I think its extremely empowering and inspirational. I hate it when I have to get a new license photo! One trick I always use now is to lower my gaze until I get my face somewhat composed so they can't snap a pic with my mouth hanging open, or some other hideous expression, lol. And I love eggs too, we go through dozens and dozens, I add them to creamy soups, casseroles, or anything that can benefit from extra protein and richness. Don't worry. I had a black eye in my last license photo, and they snapped the picture before I had a chance to smile!